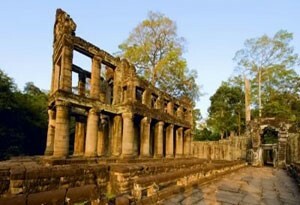 " Quality Preah Khan Temple professional, friendly service are our priorities "
History of Preah Khan temle: Preah Khan was built on the site of Jayavarman VII's victory over the invading Chams in 1191. Unusually the modern name, meaning "holy sword", is derived from the meaning of the original — Nagara Jayasri (holy city of victory). The site may previously have been occupied by the royal palaces of Yasovarman II and Tribhuvanadityavarman. The temple's foundation inscription has provided considerable information about the history and administration of the site: the main image, of the boddhisatva Avalokitesvara in the form of the king's father, was dedicated in 1191 (the king's mother had earlier been commemorated in the same way at Ta Prohm). 430 other deities also had shrines on the site, each of which received an allotment of food, clothing, perfume and even mosquito nets; the temple's wealth included gold, silver, gems, 112,300 pearls and a cow with gilded horns. The institution combined the roles of city, temple and Buddhist university: there were 97,840 attendants and servants, including 1000 dancers and 1000 teachers. The temple is still largely unrestored: the initial clearing was from 1927 to 1932, and partial anastylosis was carried out in 1939. Since then free-standing statues have been removed for safe-keeping, and there has been further consolidation and restoration work. 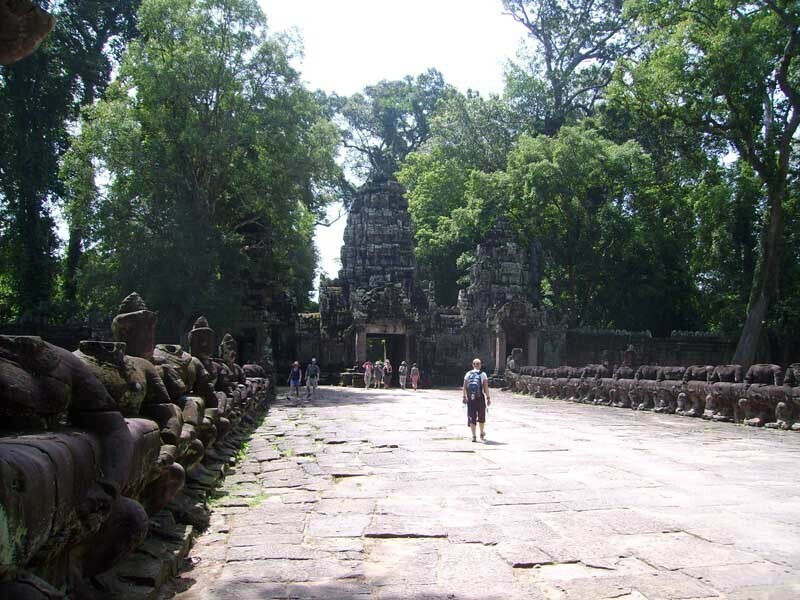 Throughout, the conservators have attempted to balance restoration and maintenance of the wild condition in which the temple was discovered: one of them, Maurice Glaize, wrote that; Preah Khan is northeast of Angkor Thom. The temple was previously overrun with a particularly voracious vegetation and quite ruined, presenting only chaos. Clearing works were undertaken with a constant respect for the large trees which give the composition a pleasing presentation without constituting any immediate danger. At the same time, some partial anastylosis has revived various buildings found in a sufficient state of preservation and presenting some special interest in their architecture or decoration. Since 1991, the site has been maintained by the World Monuments Fund. It has continued the cautious approach to restoration, believing that to go further would involve too much guesswork, and prefers to respect the ruined nature of the temple. One of its former employees has said, "We're basically running a glorified maintenance program. We're not prepared to falsify history". It has therefore limited itself primarily to stabilisation work on the fourth eastern gopura, the House of Fire and the Hall of Dancers.